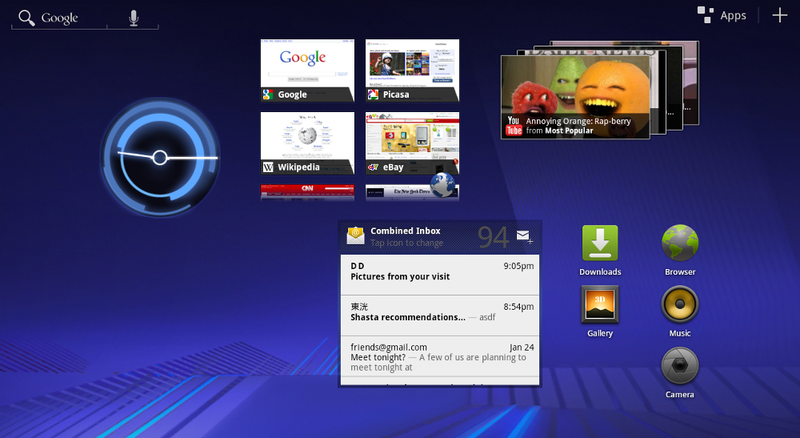 Preview of honeycomb, android for tablets. Ben. Google gave us a glimpse of Android 3.0 Honeycomb earlier this year, but today they released more details on the upcoming OS. Here's a look through what we can expect. Spoiler alert: It's awesome, and it fixes many of Android's biggest annoyances. The biggest change in Android 3.0 is the general layout of the UI. Since it's built specifically for tablets, you have much more space on your home screen for icons and widgets. This is a pretty stark contrast to the iPad, which just enlarged the iPhone's 4x4 grid with big, spaced out icons—as you can see in the screenshot above, you actually have a much denser grid than you would on an Android phone, meaning you can pack a whole lot of stuff into one home screen. The notification bar has been moved to the bottom of the screen, and they've added a few navigation buttons to it that seem to take the place of the capacative hardware buttons we all know and love on our Android phones. The three buttons, from left to right, are Back, Home, and Recent Apps. The new recent apps window is pretty handy, taking advantage of the extra space to show you the current state of each running app. The home screens themselves are pretty similar to regular Android as far as functionality—you can add app shortcuts and widgets wherever you want, swipe between five different screens, and expand your app drawer to access anything not already on the home screens. That said, the entire thing has this new 3D look to it that's really awesome (which we caught a glimpse of in our first look). As long as the hardware can keep up with the new UI, it'll be pretty awesome (we all remember how laggy the original Motorola Droid was).